Don't fuss with before & after party clean up! 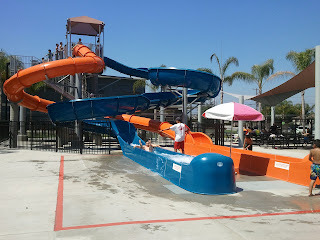 Below you will find a list of over a dozen party venues in the Montebello area perfect for birthday, team, and scout parties. Lost Worlds is at the top of my list of birthday party venues appropriate for teens & tweens. My 13-year-old son says it's like being in a real life video game, and after one visit immediately asked to have his birthday party there. 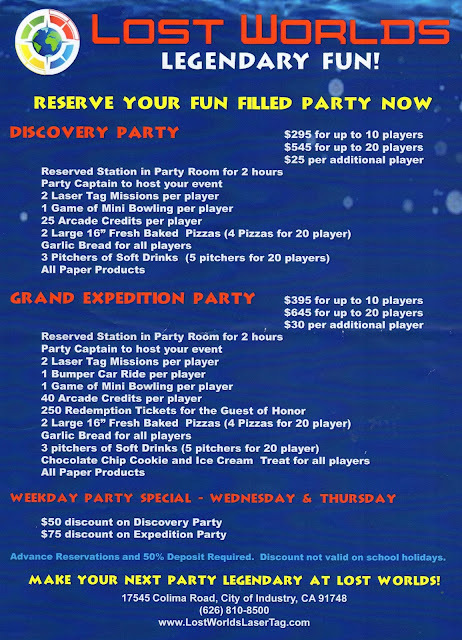 Laser Tag has been the most fun out of all the birthday party venues I have ever experienced. Kids and adults of all ages can participate, and I'm sure your family will have one of the most memorable parties of all time. All kid parties include 2 hours of unlimited bowling, shoe rental, decorations, paper goods, invitations, thank you notes, 1-2 slices of pizza & drink per person, and an empty goody bag (for the parent's to fill). Minimum 8 people per party. Regular Bowling Party: $17.99 per person. Extreme Bowling Party: $21.99, Lights dimmed, disco lights, videos, and music. Saturday/Sunday 1-3pm and Friday/Saturday 8pm -1am. 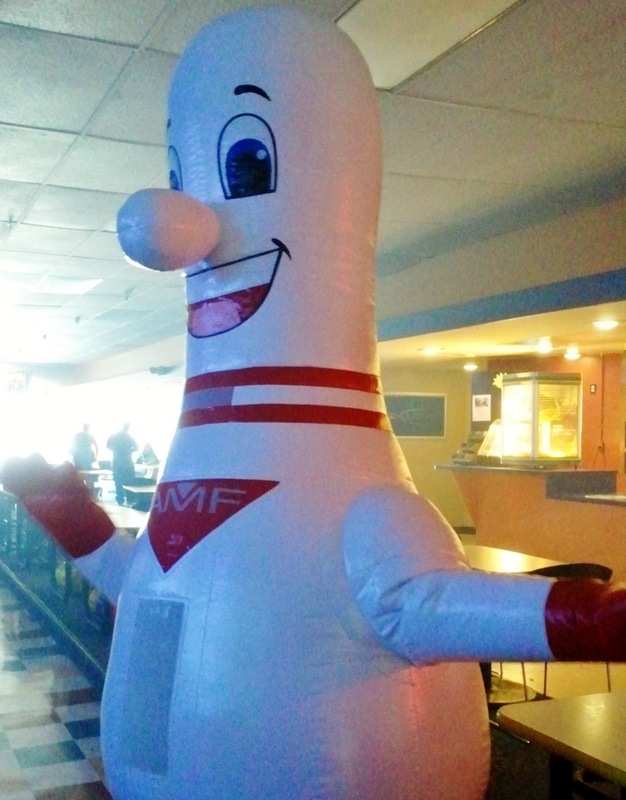 You can also ask for the Pizza Bowl package which includes bowling, shoe rental, pizza, and a pitcher of soda for 6 people for under $75. Minimum of 6 guests. Packages start at $10 a person. The party is held in the back of the store. Food is not allowed in the store, the manager suggests after the party taking the group downstairs to Hot Dog on a Stick which offers party packs and a discount for Build-A-Bear parties. The Ticket Blaster, where one special ticket is worth 1,000 tickets! Minimum of 4 children required for a party reservation. Packages are $13.99-23.99 per child. Coupons can be used for other food purchases. Bonus: Kids can also play online games to earn vouchers that they can trade in for tickets at Chuck. E. Cheese, They can also bring in their report card, the better the report, the more free tokens they are given for games. Specializing in glamor/girly parties. Minimum of 4 children, deposit required. Prices are $30 per child, some parties have a set-up fee. Pico Rivera: $20 Deposit required. Tables are reserved in the party room, which holds up to 100 people. Monterey Park: $40 deposit required. Tables can be reserved in game room or anywhere in the restaurant. Prices start at $25 for reserving a shelter area during regular summer operating hours, $1 admission for children and $2 admission for adults. They said they are not used to having parties there, but you can reserve the cages and eat at the park. One hour $29. Half an hour $18. Grant Rea Park: Shelters 1 & 2. There are 4 shelters total. Reserve a shelter at any of the city parks for $57 Residents, $83 Non-residents. Or wake up early to grab a prime spot under the shade. Many parks have free standing tables with trash cans & BBQs nearby. Favorite party spots include: Grant Rea Park, Reggie Rodriquez Park, Montebello City Park, Acuna Park, Holifield Park, and Potrero Heights Park. Splash Pad at Grant Rea Park. Potrero Heights also has a Splash Pad. Parties include cake, party favors, and ice cream in the Play Area. The play area is not reserved, so parents should schedule the party around busy meal times and arrive early to save tables. A deposit is required. Minature Golf, Go-Karts, Arcade, Train Ride, Bumper Boats, Bumper Cars, Disk O' Thrill ride. 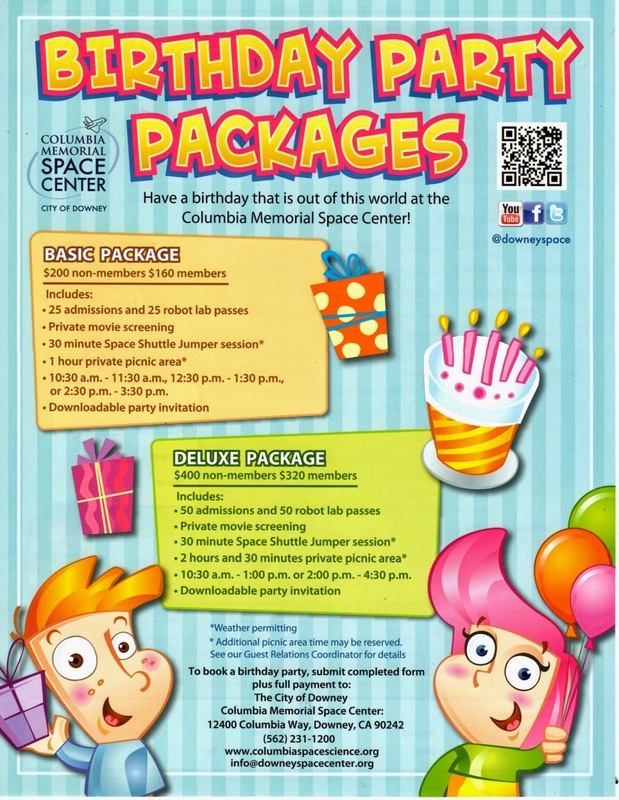 Party packages include pizza, drinks, ice cream, party hats, and invitiations. Indoor inflatables. Party packages are $225-330. Play & music parties for babies-preschoolers. Prices vary by location. Play & music parties for babies-elementary school. Prices vary by location. A toy store with clothes, arts & crafts and other goodies for kids. A party room is available. A paint your own ceramics store. Party packages are $18-24 per painter, minimum 6 guests. An ice cream parlour complete with balloons, Styrofoam-straw hats, and a big bass drum to wish a Happy Birthday. $13.99 a person includes pizza or chicken, drinks, sundae, and more. Go-Kart racing, video games, mini-golf. What more can a kid ask for, maybe pizza, but they have that too! Best for older kids & teens as there is a height & age requirement for go-karts. Two hours of playtime in one of four areas of the museum. Includes full-day museum admission for all party guests, paper goods, goodie bags, & invitations/thank you note. Parties range from $405-$700 for 30-40 guests. 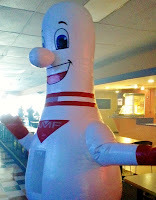 Indoor inflatables & video games. Packages are $195 - $325. Private party room and admission to the museum for all party guests. Party packages range from $225 - $425 for 35-40 guests.